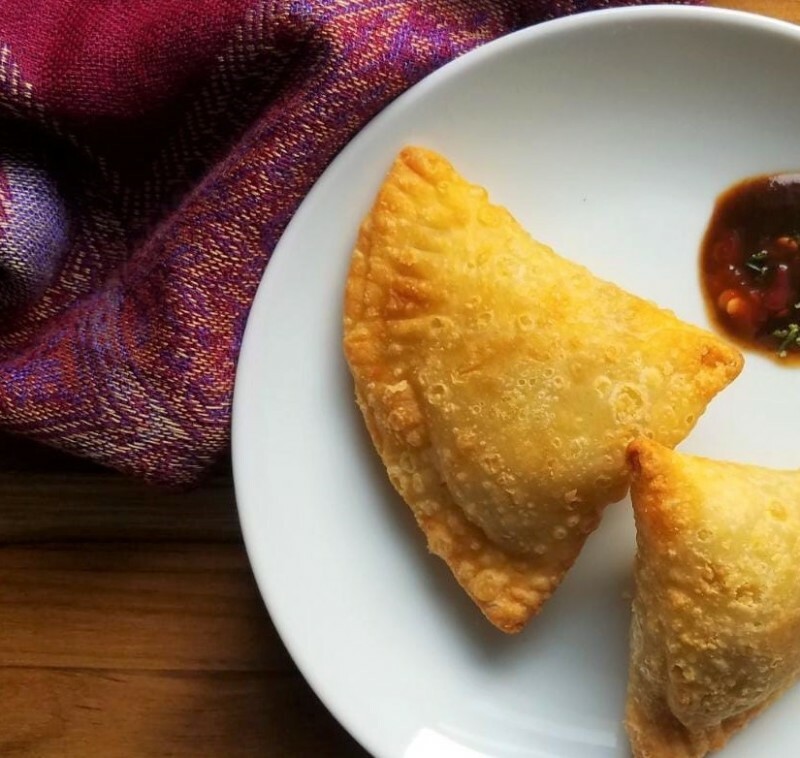 Punjabi samosas are a flaky fried pastry stuffed with a slightly spicy potato and pea filling. Growing up, they were the thing to serve when my parents were entertaining or whenever we were celebrating. We would make hundreds for Christmas, a birthday party, or a wedding. When I was young, my job was to help make vats of filling. Later, I was promoted to dough maker, and then taught the careful art of samosa folding, and finally elevated to frier-in-chief. I’ve now taught my own kids how to make samosas, though we never end up making the massive batches I remember from my childhood. I’ve adjusted my parents’ traditional recipe and now use a “half-fry” method. We give the samosas a quick dip in hot oil so that the outsides get slightly crisp, and then finish them in the oven. 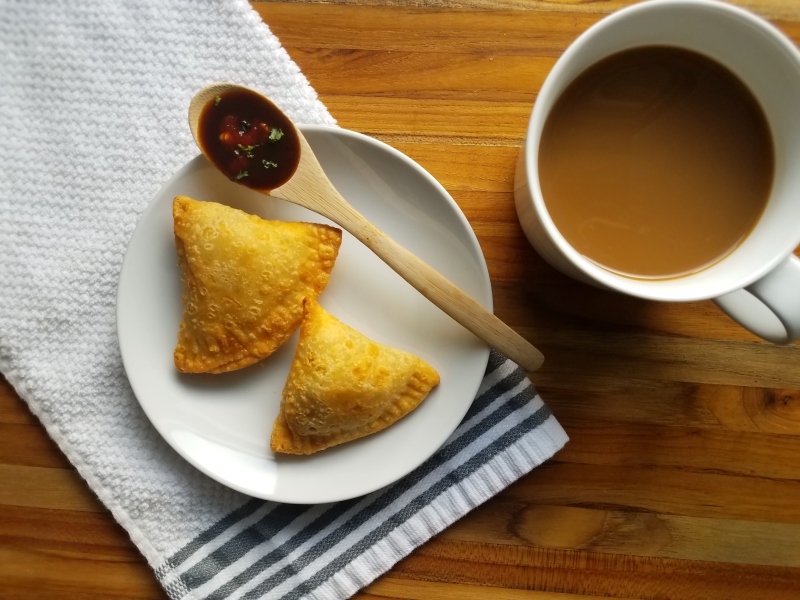 The samosas can be frozen or refrigerated before baking, which makes them a perfect make ahead snack or appetizer. Or you can have them the way I love them best, as a late breakfast on a weekend morning. Before you ask, you really do need to at least half fry them. We’ve tried a fully baked version, and the dough consistency is never the same. 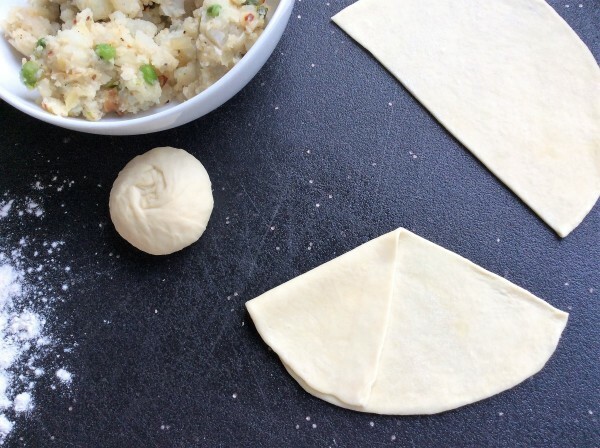 Making the filling and samosa dough is an easy process, but it can take some practice to get the folding right. I’ve tried to capture our method in the photos, but it can be helpful to watch a few youtube videos before you get started. The main thing to remember is not to overfill them and to make sure you crimp them completely closed. That prevents the samosas from exploding when you fry them. Bring a large pot of salted water to boil and add the potatoes. Cook until fork tender, usually about 15 minutes. Drain and let cool in a large bowl. While the potatoes cook, heat 3 tbsp vegetable oil in a medium frying pan. Add cumin and cook for about 1 minute or until the seeds make a light popping sound. Add ginger to the pan and saute 3 mins before adding the onions and green pepper. Saute the entire mixture until it’s a light golden brown, about 8-10 minutes. Stir in the spices and remove the onion mix from the heat. Once the potatoes are cool, mash them lightly with a fork. 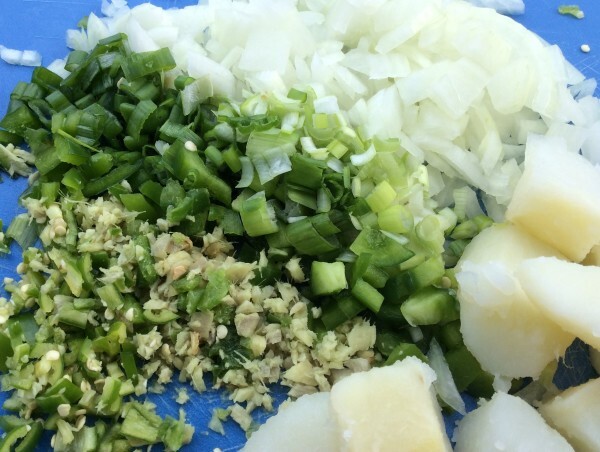 You want the mixture to still have small chunks of potatoes rather than being completely smooth. Add the onions to the potatoes and stir to combine thoroughly. Give the mixture a taste and add salt and pepper as needed. Pour flour into a large bowl, make a well in the center, and pour the salt, water, and oil into it. 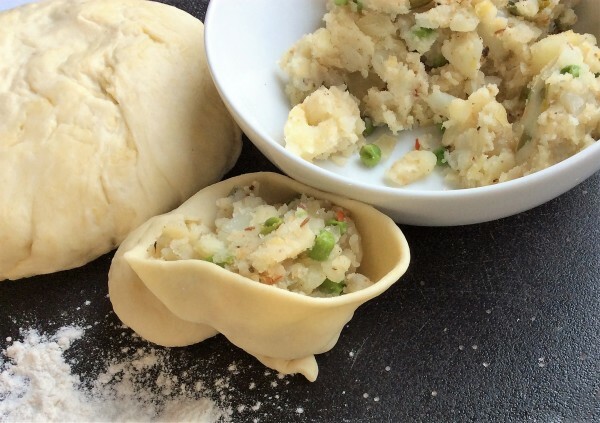 Stir with a wood spoon until the dough comes together. The dough should be soft and slightly sticky. Take cooled dough out of fridge and divide it into 40 balls, about 2 tbsps of dough each. Working with 1 ball at a time, roll dough into a 6" round; cut in half. 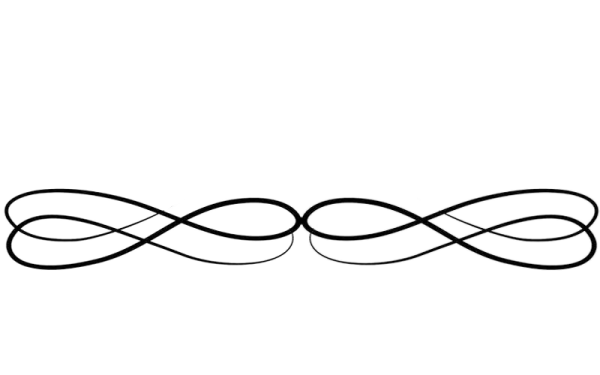 Gather straight edges of the half-round together, overlapping by 1⁄4" to form a cone. Moisten seam with milk; press to seal. Spoon 2 tbsp. filling into cone. Moisten edges of cone with milk; pinch with a fork to seal. Heat 4" oil in a 6-qt. saucepan until a deep-fry thermometer reads 350°.Fry samosas until light brown but still fairly pale, 3–4 minutes. Drain on paper towels. If freezing, place on a single layer on a cookie sheet and freeze for one hour or until solid. Then transfer to gallon sized zipper bags and freeze until needed. When ready to bake, bake from frozen as instructed below, but add a few extra minutes to the baking time. Once ready to bake, spread samosas on a lined baking sheet leaving about a half an inch between each. Bake at 375 for 10 minutes or until crisp and golden brown. If you want to fully fry the samosas, leave them in the oil for another 3-4 min until they are crispy and a deep golden brown. These are tasty with ketchup or with ketchup mixed with a little tamarind paste (you can buy some at indian grocery stores or online).